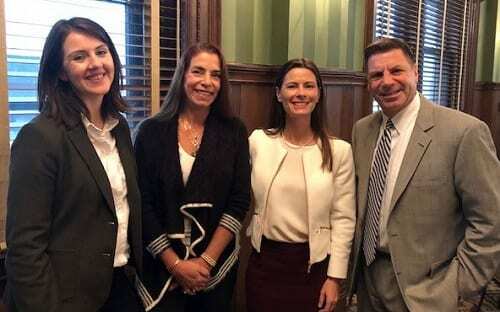 Left to right: Elaina Heagerty, Quality Improvement Specialist at St. Peter’s Health Partners; Maria Sacco, Project Manager at Healthcare Association of New York State (HANYS); Amy Boutwell, M.D., MPP, President of Collaborative Healthcare Strategies; and Peter Semenza, Vice President for Philanthropy at St. Peter’s Health Partners. Held at the Fort Orange Club in Albany and attended by hospital leaders from across the Capital Region, the workshop focused on redesigning care processes to ensure patients and their care partners are kept at the center of the care-planning process. The workshop was led by Amy Boutwell, M.D., MPP, President of Collaborative Healthcare Strategies. Dr. Boutwell is a nationally recognized thought leader who asked participants to interact and share actions that can be taken to improve communication and coordination of care in the hospital setting. Dr. Boutwell challenged the group to identify what actions they can take in the next seven days to improve current processes or adopt a new best practice. Following the workshop, participants were offered coaching calls to further assist teams with redesign. The program supports Partnership for Patients, a national collaborative to improve quality and patient safety funded by the Centers for Medicare and Medicaid (CMS).